The MOSSAD has the 'bad guys' in their sights. This MOSSAD inspired T-shirt sports a target with the word WANTED over it. You don't want to be in the Mossad's sights. 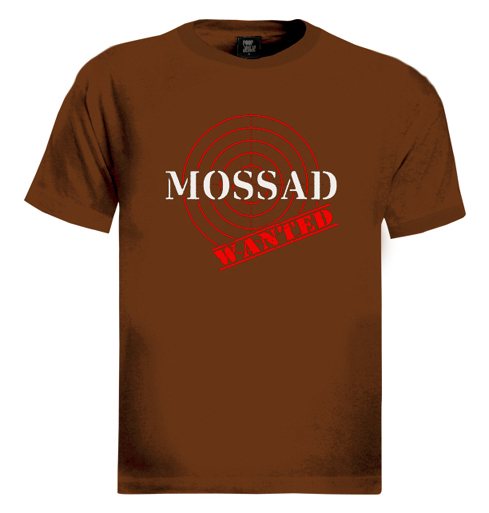 This basic men's Israel T-shirt sports a red target on the front with the words 'Mossad' and 'Wanted' stamped over it in white and red letters, respectively. As the recent operation in Dubai continues to make waves around the world, show your support for Israel and for the Mossad.+This men's crewneck tee is available in black, brown, blue, or green. Fans of Israel and the Mossad will like this design, an example of the Israel-themed T-shirts that have long been popular souvenirs.+Israeli-themed T-shirts make wonderful gifts for family members, friends, and colleagues. Our T-shirt designs cover all sorts of Israel-related trends, IDF T-shirts – a perennial favorite - and styles featuring Mossad, Israeli Special Forces, and Israel Air Force.+Our preshrunk Israel T-shirts are made from 100% ring spun cotton. Other fabrics might cost slightly less, but we use this cotton because of its high quality and particular softness. We are determined to use the best quality materials available to make our men's and women's T-shirts and guarantee 100% customer satisfaction with our product.+Please note that T-shirts made from 100% cotton may shrink up to a full size when laundered, even if they are preshrunk. Please follow proper washing procedure.